The team here at Voltacon LED Lighting have repeatedly shown ourselves to be capable of thriving in the face of any challenges that come our way, however, the job presented to us by Watford Borough Council appeared to be more dynamic than most. Watford Council told us that they had been experiencing problems with the lighting at the Town Hall site on Hempstead Road in Watford for some time, and needed fresh solutions to bring the building up to speed. The main issues that the council representatives identified were unacceptably high rates of expenditure – the antiquated light fittings were eating up large amounts of the council budget thanks to their levels of energy consumption – and unsuitable conditions for workers at the Hempstead Road site. The Voltacon team began by removing the 60cm T8 tubes that the Town Hall was using to provide light, replacing them with LED panels. These LED panels are slimline and are manufactured using cutting edge technology to make them as unobtrusive as possible. Over the whole building, it is estimated that the panels will reduce electrical energy consumption by over 80%, a total saving which can be enhanced even further through the implementation of Voltacon’s patented dimmer technology. The team installed the Osram 1-10V dimmer switch in all working areas throughout the Borough Council’s building, boosting the savings even further. After staff have been properly trained on when and how to utilise the dimmer technology, it is estimated that savings could reach as high as 90% when compared with the original system. With the new systems already in place in some areas of the building, staff members are reporting a greatly improved experience within their working environment. 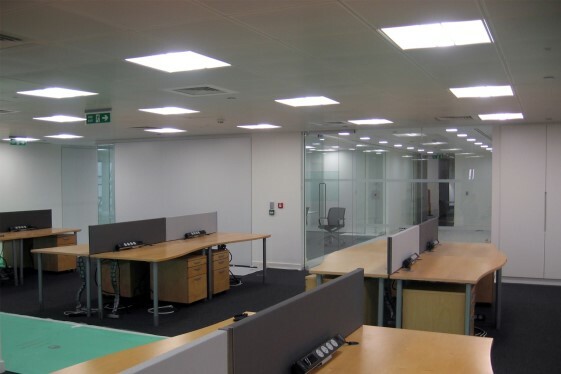 Light levels of 600lux are now produced around areas with desks, making it easier for members of staff to carry out tasks while also reducing the eye damage associated with working in dim conditions. Thanks to the handy Osram dimmers, light levels can be adjusted in different parts of the office to allow for changes in conditions throughout the day and throughout the year. The first phase of this project is now complete and ninety of our 40w LED panels have been installed within the council building. We decided to use natural white panels, as these mimic natural light to create a relaxing working environment for staff members. Emergency conversion packs were also installed in the building, as per the legal requirements for a building of this type. Initial reports have been excellent, and we are now preparing to roll out the next phase of the installation work.